. 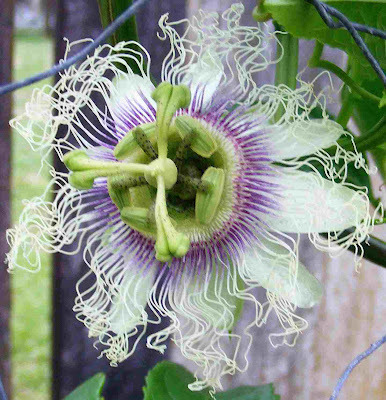 Passion fruit flower . For those who may not have heard of the passion fruit, it is a smallish dark purple coloured fruit, round-ish and full of yellow flesh and smallish black seeds, and a wonderful flavour! You scoop the flesh and seeds out of the shell with a knife and teaspoon and crunch up the seeds with your teeth as you eat the flesh. Mm mm! . Above is the flower of the passion fruit, which is very exotic-looking, and is also quite unusual because once the flower has been pollinated the fruit grows right out through the front of the dying flower. The fruit begins green and as it ripens it turns deep purple and is then ready to eat. I think that they taste best if picked when they turn purple and are placed in a shaded place for a few days until the skin begins to wrinkle. How wrinkled doesn't matter, so long as the fruit doesn't dry out completely and the skin turn a brownish colour. It then becomes too dry to enjoy. . If you have not tried them be adventurous and give them a go. You will enjoy them!